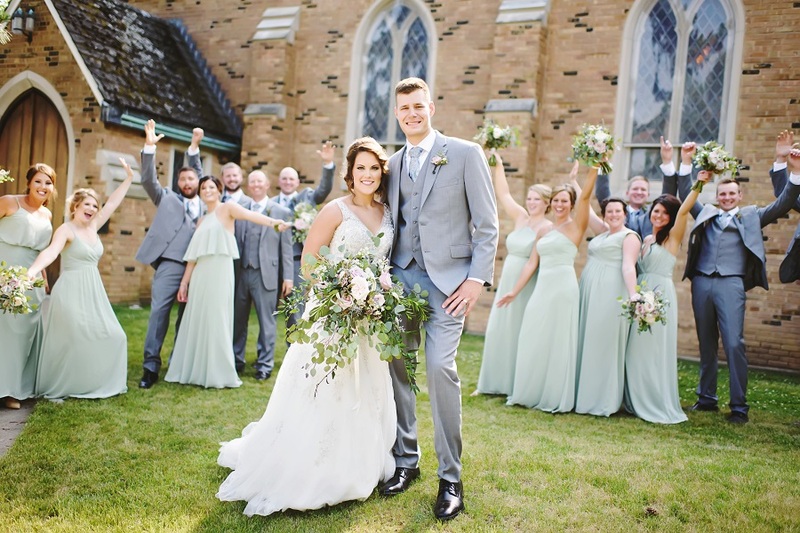 Kate and Austin met through mutual friends at the local watering hole “The Vault Bar & Grill” while he was at ISU and she was prepping for grad school. They enjoyed hanging out and studying together and were regulars at The Vault Monday night’s bacon pizza and $ beers. As their friendship grew, Austin asked her on their first official “date” where they went to Granite City in East Peoria and stopped for ice-cream on the way home. Stopping for ice-cream became a ritual during the course of their courtship. 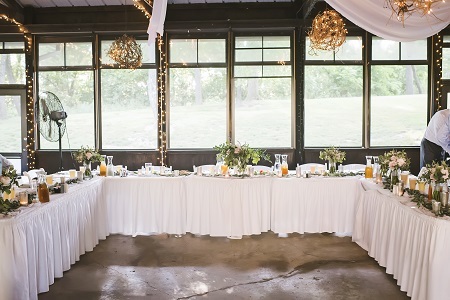 How did you decide on a theme for your wedding decor? 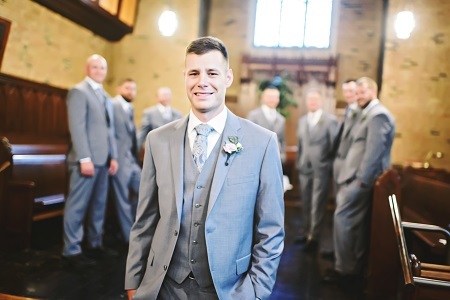 This came really natural – we didn’t want anything that wasn’t “us” when it came to our big day. 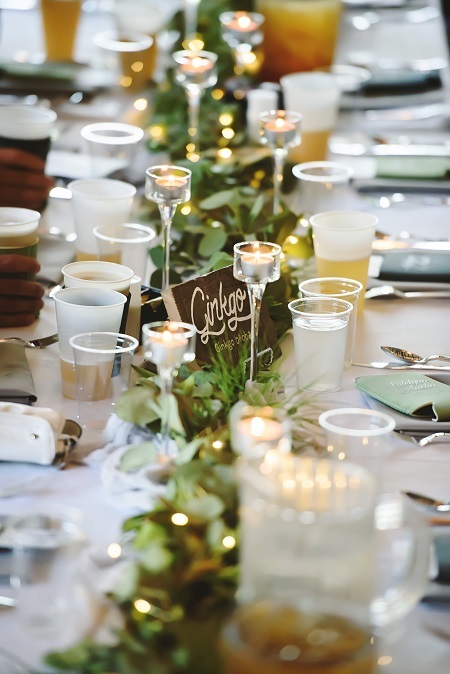 We both love outdoors, we farm and we like to keep things simple (but wanted a classy, elegant touch) so we went with the things we love – lots of greens, garlands, candlelight, some beautiful floral arrangements and mercury glass accessories for that elegant touch! 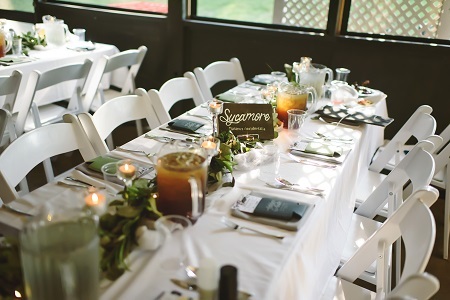 A unique touch was the table signs that each had the name of a tree which went perfectly with the wedding decor theme of outdoors and natural. I enjoyed doing the wedding flowers the most since I come from a horticulture background and have a degree in horticulture. 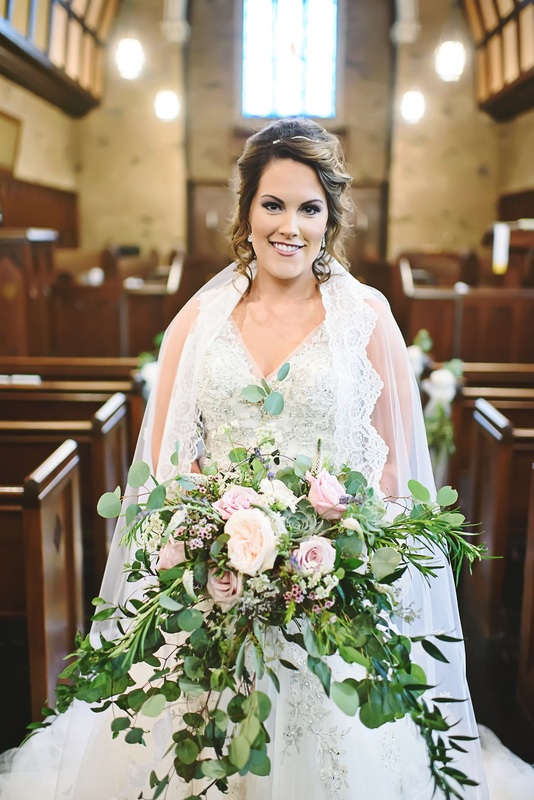 Kate wanted a lot of mixed greens in her wedding flowers, wedding decor and bridal bouquets to give a garden feel and look. We used silver $ eucalyptus, rosemary, Italian ruscus, nagi and tree fern to achieve that garden feel. We also incorporated succulents along with garden roses, lavender, wax flower, orlaya and veronica for the blooms in the bridal bouquets and table centerpieces. What did you find most difficult about wedding planning? 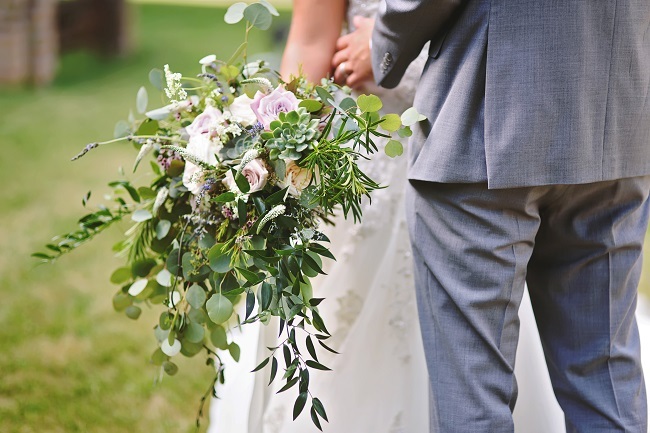 I am very organized and like things done ahead of time – so that turned out to be the most difficult thing as we were finished with everything by April for our June wedding. It was a stressful time for Austin and me to complete everything. Later I kept thinking I should be doing something but my wedding coordinator, Katie Gerber of Perfect Glow, was amazing and assured me in reality I had it all done!! Would you change anything if you could? No. I wouldn’t even change the weather (it was 95 degrees and very humid)! Everyone thinks they want a perfect wedding, but in reality it’s the things that go array (like the weather which we couldn’t control) that make your day memorable!! Our wedding day was the most perfect day of our lives and I am so excited to get to spend the rest of my life with my best friend. At the end of the day it’s about the love you share with your partner and the vows and promises you make to each other during your ceremony. 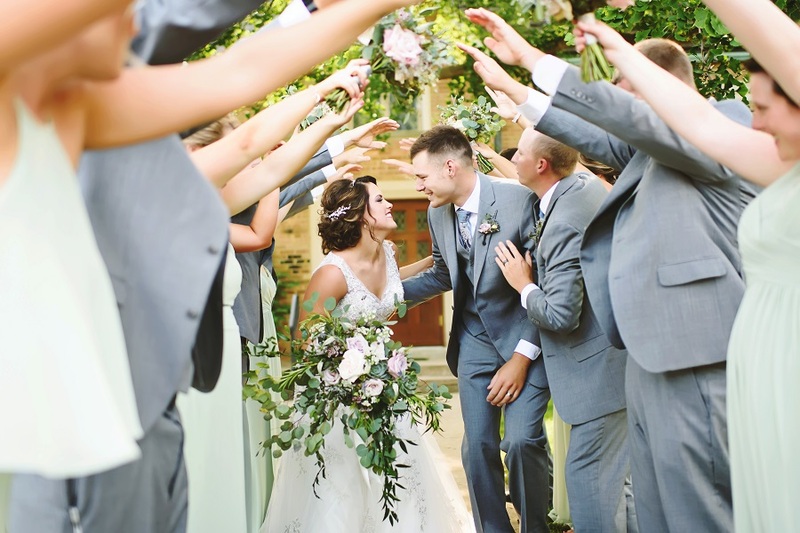 It’s about the love that will radiate off of you, your partner and your guests that day which you will want to carry on with you for the rest of your life! Don’t focus on the little things – focus on each other and what makes your love and your relationship unique! 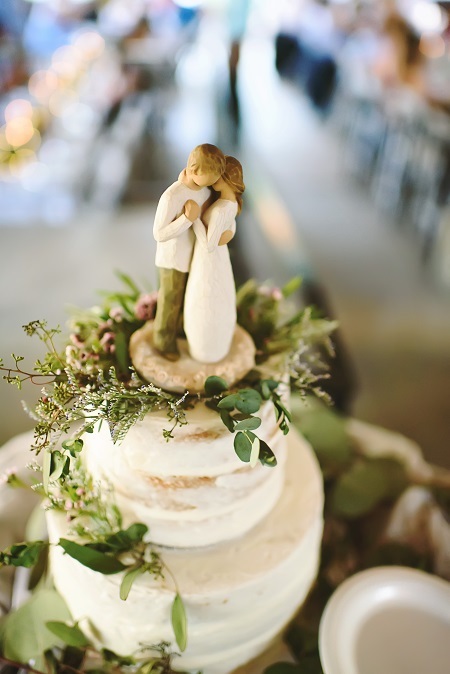 Focus on what a wedding truly is supposed to be about – LOVE!! 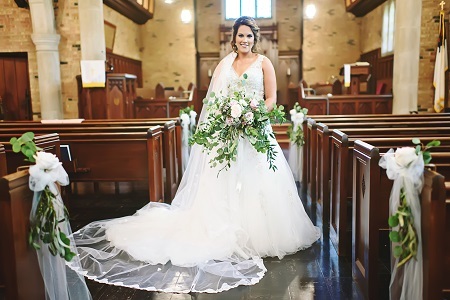 What did Kate think about the wedding floral decor, bridal bouquets, bouts and centerpieces we did for her? Nancy is the epitome of floral art and talent. Nancy took my vision and made it happen. The flowers were gorgeous even after hours in 92 degree weather! Nancy is patient, kind, and very easy to work with. Her husband, Wayne is pretty talented as well with the garland. 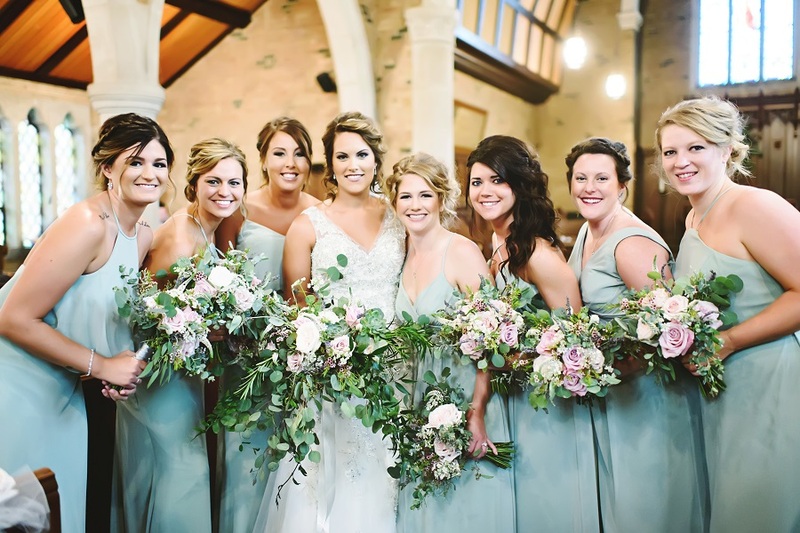 You will not be disappointed by booking with Fancy Florals by Nancy! Wedding photos by Katelyn Turner Photography. 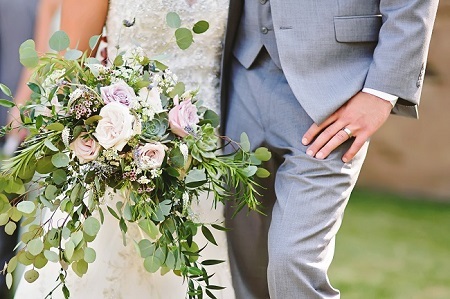 Want to receive tips from our real brides? Sign up at the top right of our blog to receive a notice each time a new blog is posted.